Your relaxing spa experience starts with a dirt-free and soothing bathroom. Until it gets a hygienic look and calming feel, you will never feel relaxed. So, de-clutter your bathroom by getting rid of everything damped in it and re-organize the essentials to take your first step towards creating a spa-like bathroom. Before you start giving yourself the at-home spa treatment, it is important to create the perfect atmosphere and set the mood. The presence or alignment of lighting plays a key role in generating a relaxing ambience in the bathroom. Keep all the blinds closed and put on some scented candles or tea-lights. It will replace the harsh light with a soft soothing glow and help you calm down. A relaxing spa experience remains incomplete without some calming music. It can be any kind of soft song or simply some comforting tones. Just turn the music system on to enter a playful mood by getting de-stressed and chill out. A spa without the use of essential oils can never ever be imagined. So, collect the most excellent essential oils like lavender oil, rose oil, geranium oil, vanilla oil, and so on and get into the mood with the help of their highly comforting fragrance. Taking the utmost care of your skin is important, especially while undergoing a spa treatment. No matter whether you are visiting a luxury hotel spa or trying the same at your own bathroom, you can always pamper your skin with a body scrub (containing sugar or salt) that comes in your budget. From exfoliation to boosting circulation o cellulite reduction – these scrubs can serves a number of purposes. Invest in some thick, soft and cozy towels that can give you the most enjoyable spa experience even in your own bathroom. 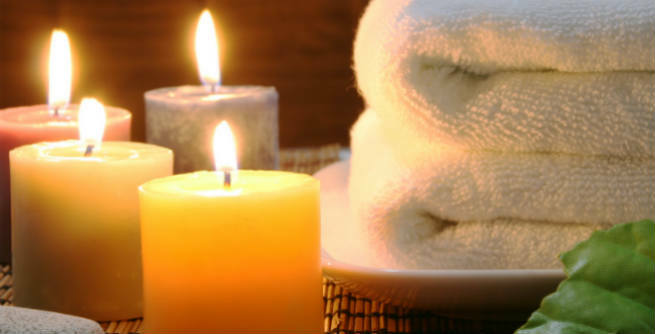 Either get some spa robes or simply drop some essential oil of your choice in your large and thick towels to prepare the scented towels at home. Keep the cold, tiled bathroom a little warm. However, make sure that it doesn’t give you a draughty feel, when you are indulging in a relaxing bath. Stop using those fluffy rugs for your bath. Rather, switch to the neck pillows, which are easy to both avail and blow up. Place all your towels right on the radiator so that you can reach them as soon as you get out of the soak. Opt for an aromatic reed dispenser and try the notes of lavender. It will help you unwind in the most effortless and joyful way. Find the right light fixtures that go excellent with your bathroom and its ambience. The system should be installed on a dimmer switch for making adjustments as required. Choose a showerhead that gives a rain-like water flow. Going round, square or wide will work the best.